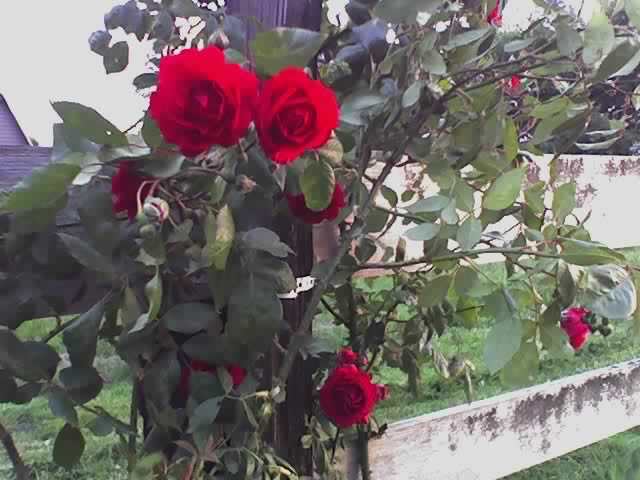 Roses remind me of my Cousin Lester. He's got a farm on Maryland's eastern shore and his hobby is roses -- red roses, white roses, pink roses, yellow roses, I think he's got 'em in every color (although I'm still looking for ones in neon green). Hope you're grinnin' like a loon! Oh my gosh, Mac, they're gorgeous! Whew, I haven't planted a thing, can't. Too much rain, everything will drown. I think I'll just click on your roses, now and then, and drool. The honeysuckle, too. I'm the opposite--this is the first year I haven't planted anything. My yard is colorless and looks so odd. I've no dirt to play in. The local nurseries are backlogged, rather, waterlogged w/ inventory. It's a shame. I love roses. That is a beautiful picture. My Grandma used to have a lot of rose bushes at her old house but hasn't replanted any since she moved. My favorite of the ones she had were bright pink on the edges and faded to almost white. My green thumb tends to be a bit black. I don't do good with plants of any kind, though I sure wish I did. vhJM, do yourself a favor, then, and get the biggest planter you can manage. Having something above ground may give you enough drainage to grow something, even if it's a hosta. Mac, they're gorgeous. I'll bet the English roses would do well there. Beautiful series of photo posts, Mac. Thank you for sharing a bit of your world with us. We're still waiting for ours to grow, so tell your flowers to cheer mine up! !